Jack White has built a turntable to play a record in space | What Hi-Fi? We recently heard rumours that Jack White wanted to fulfil an ambition of his, to be the first person to play a vinyl record in space. Now he’s explained how he’s going to do it. 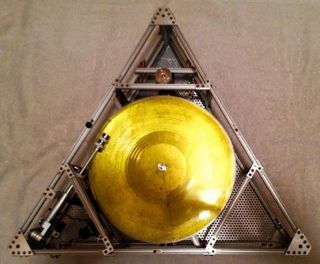 His record label, Third Man Records, has built the "Icarus Craft”, a custom-made “space-proof” turntable that will be sent up into the atmosphere tied to a high-altitude balloon. The lucky record that has been picked to be played is a 12in gold-plated master of astronomer Carl Sagan’s A Glorious Dawn, released on the Third Man Records label in 2010. Third Man Records released a 7in pressing of the track in 2009 to celebrate Carl Sagan’s 75th birthday. There will be parties at both Third Man Records locations in Nashville and Detroit on 30th July when the launch is due to take place. A pre-recorded stream of the launch will be available online at 12 noon the same day. Until then, the Icarus Craft turntable will be on display at the Detroit store while the 12in record with be on show in Nashville.